A certificate is diamond's "fingerprint". A diamond grading report is a detailed explanation of a diamond's characteristics such as its cut, weight and dimensions. Many diamonds are certified by an independent laboratory so that purchasers can feel confident that their diamond is indeed of the quality the seller represents. A certified diamond's quality is guaranteed, and is therefore more valuable than an uncertified stone. A certificate verifies diamonds identity and value and is recognized by all gemologists. Diamonds are certified by independent grading entities whose expert gemologists evaluate each diamond's particular characteristics and attributes, such as clarity, cut, color, carat weight, fluorescence and other characteristics. Diamonds from Diamondrings.co.za are graded by either the EGL (European Grading Laboratory), IDL (Independent Diamond Laboratory), GIA (Gemological Institute of America), or IGI (International Gemological Institute) - diamond trade’s most respected grading entities. All of these institutes including the EGL, IDL, GIA and the IGI are known for their consistency, stringency and impartiality when grading diamonds. 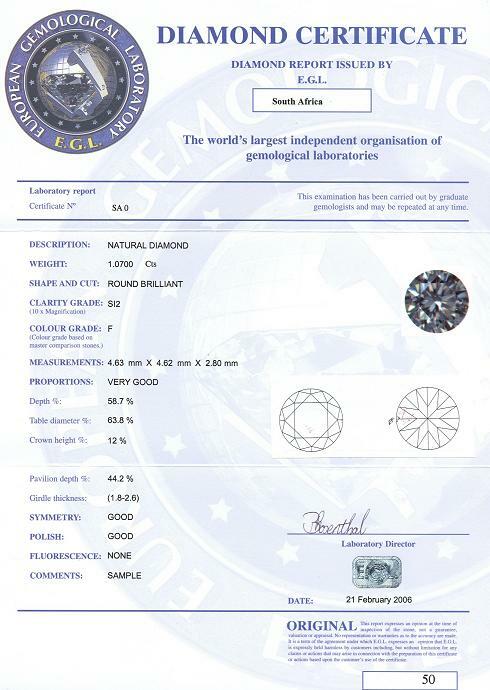 Below is a sample diamond grading report from the European Grading Laboratory, the foremost authority on diamond grading. A diamond grading report (or a certificate) from an independent laboratory is not a valuation, which estimates the monetary value of a particular stone. It is an unbiased, informed opinion made by an experienced gemologist on a diamond’s characteristic and specification. On all diamonds over 0.30ct in weight, you will receive the original certificate or report – unless otherwise specified. Diamonds under 0.30 in carat weight, or small ‘parcel’ diamonds are not usually considered for certification.